We offer orthodontic treatment to help patients of all ages obtain a straighter smile. Instead of braces, we actually offer a series of clear aligners with the Invisalign system. 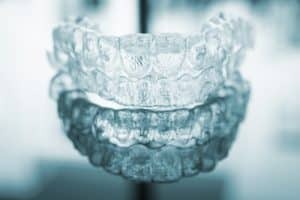 What are the benefits of Invisalign? How does this system differ from metal braces? The Invisalign system employs a series of clear aligners to correct misalignment. The aligners are worn each day for between 20 and 23 hours, removed only for meals and dental maintenance. The total treatment time takes about a year to 18 months depending on the severity of misalignment. The patient upgrades to a new set about once every two weeks. We can help patients of different ages and with different levels of alignment problems enjoy a more even, healthier smile. Barely Noticeable: The aligners are made from clear plastic, which means when worn they are barely visible. This makes treatment much more popular with adults and teens interested in smile improvement, but wary of wearing metal orthodontics. Comfortable: The aligners are more comfortable than braces, sparing patients gum and cheek irritation. Removable: Since the aligners can be removed, you don’t have to change how you eat. With braces, patients must avoid hard or sticky foods, which can become stuck in orthodontics or damage them. In addition, this makes brushing and flossing the teeth significantly easier too, helping your smile stay free of discoloration, tooth decay, and gingivitis. If you have any questions about misalignment or the Invisalign system, then please contact our team today. We can examine your smile to see if clear aligners are the best choice for correcting your misalignment and helping you enjoy a healthier, more esthetically pleasing smile.